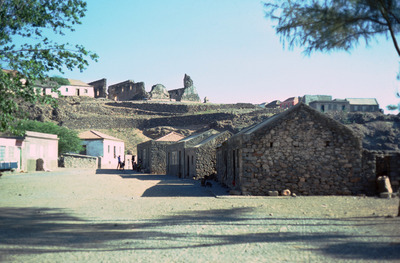 Once the capital of Cape Verde, Ribeira Grande, renamed Cidade Velha, has been in decay since 1712 when it was attacked by pirates. Today it has the population of an ordinary village, but the villagers live amongst the ruins of a 17th century colony that includes a slave market with an auction post that serves as a reminder of the islands historical involvement in the slave trade. On the horizon are the ruins of an old cathedral.